Here are some comparison photos of a fake, and an authentic pair of Raf Simons' 'Astro' pocket sneakers. The real ones are in high demand and retail for around $725. They come in several colors of leather. Below is the black patent leather version. 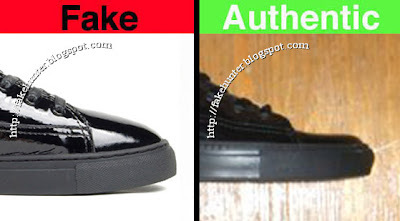 With the authentic kicks going for such high prices the fakes might be lookin' pretty good to you, but don't give in. Pictures can be deceiving. 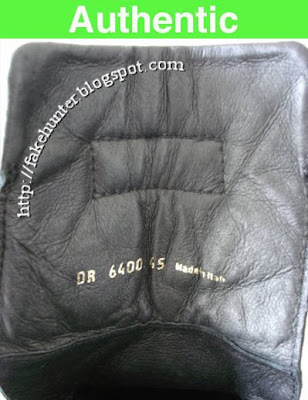 If you study them carefully it quickly becomes apparent that the quality of the fakes is crap. For those who appreciate quality and design, it's worth hunting for the real thing. In the above profile view you can see some of the minor differences in the lines of the stitching on the side. Also note the difference in shape as it wraps around the back. You can see the difference in the toe of the sole too. 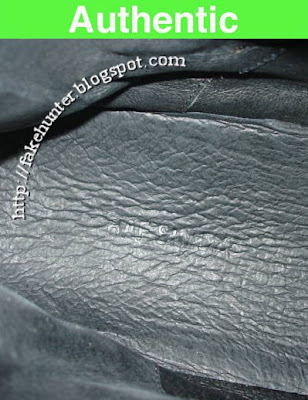 The rubber toe cap of the fake has a flatter edge, whereas the authentic pair has a more rounded profile. When looking down on the shoes it is apparent that the real shoes have a more pointed shape, in comparison the the more rounded toe of the fakes. And, the stitching at the base of the tongue is lower on the authentic pair. The zipper on the back of the pocket should be silver, not golden. If you enlarge the image above you can also see the difference in the zipper toggle. 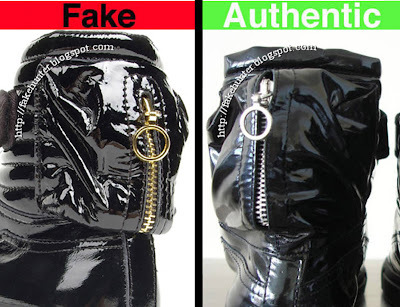 However, not all of the fakes have gold zippers. Some do have silver ones. 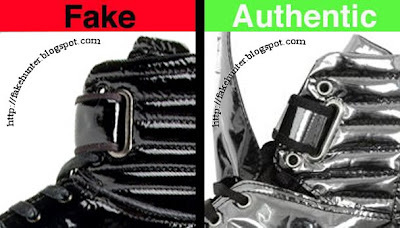 The above example shoes how many of the fake straps vary from the authentic ones. The fakes are slightly wider with a narrower fabric edge. It also appears that the hi-top part of this fake is straight, instead of at an angle like the real ones. 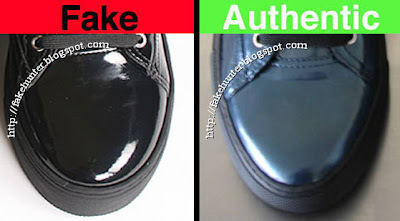 Some of the fake versions of these shoes are made without the double tongue (but be aware that there are better fakes that have the double tongue). The authentic 'Astro' shoes have two tongues that attach together with a rectangular patch of Velcro at the top. The fake above is stitched wrong, with a half-inch between the stitching and the edge of the tongue. The fakes I've seen that do have the double tongue have more rounded corners on the outer tongue than the relatively squared corners of the authentic shoes. Here is an example of what the inside of the tongue should look like. 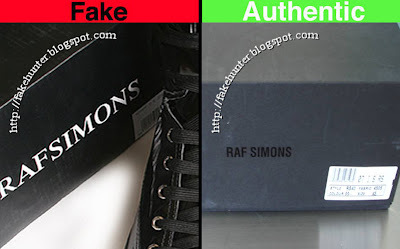 Below that is a photo of the embossed "Raf Simons" logo that should be stamped on the insole of the shoe. Lastly, check the box. If the box is fake, chances are the shoes are fake too. The Raf Simons box should be a dark gray color made out of a flat cardboard (not corrugated). It should have a small glossy black logo on each end, and it should be blank on the top, bottom and other two sides. very good ! go ahead ! awesome idea for a blog. will you please do a post on some marc by marc jacobs? thanks and keep posting! i just got a pair and the hardware isn't silver. everything else looks okay though. 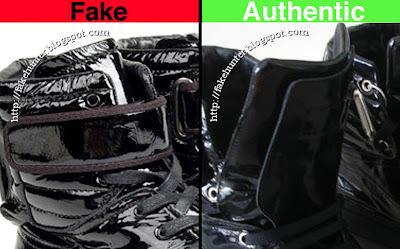 Very Great Post!, show the difference between original and fake.